Growing mushrooms requires the necessary expertise. In the end, only the best-looking and most full-bodied mushrooms make the grade. Over the years, we gathered, improved and modified this experience in order to produce the compost best suited for the end product. A natural process that can be emulated with modern techniques. Organic waste materials from nature form the basis of the compost. These waste materials are selected with the utmost care and determine the end quality of the compost. During the composting process the ‘superfluous’ organisms are naturally eliminated by means of high temperatures, leaving only the organisms which are needed. After the compost has been pasteurised and conditioned, the remaining organisms turn it into nutrient-rich compost excellently suited for inoculation. One of the last phases is to add the mycelium. In this phase the desired mushroom spawn is added, which ultimately produces the product from which the mushrooms will be grown. The carefully cultivated compost is delivered under the correct hygienic conditions and at the right temperature to assure the mushroom grower of its quality. 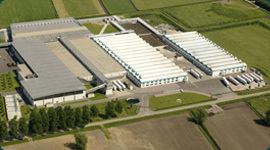 Hooymans Compost B.V. applies various techniques during this process for testing the quality along the entire production line. This procedure is supported by an in-house department, and better solutions that can produce even better results are constantly looked for.